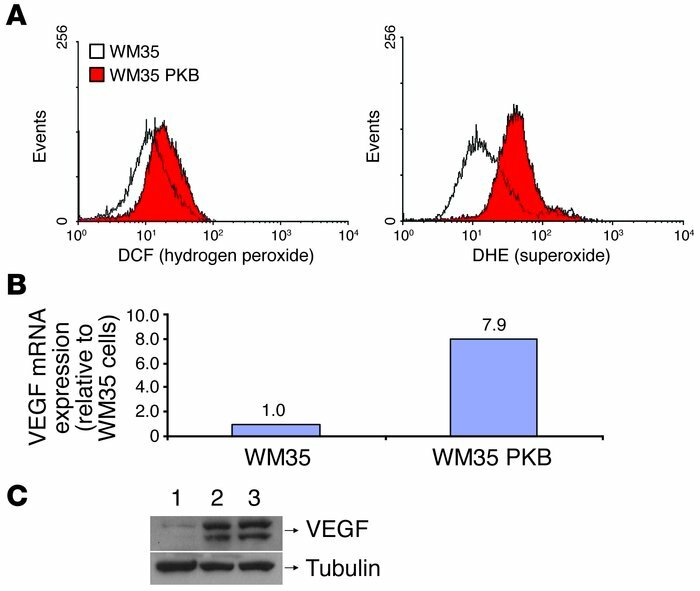 Introduction of Akt into WM35 cells results in increased intracellular ROS. (A) Quantitation of hydrogen peroxide by dichlorofluorescein (DCF) fluorescence and of superoxide by dihydroethidium (DHE) fluorescence. (B) Akt overexpression led to increased expression of VEGF mRNA. (C) Increased expression of VEGF protein in WM35 cells overexpressing Akt compared with parental controls. Lane 1, WM35 cells; lane 2, WM35 PKBDD cells; lane 3, pooled Akt-transduced WM35 cells. Tubulin is included as a loading control. Experiments were performed in triplicate.